Today I am home. Alone. The girls started school on Tuesday so that makes today the second day this week that I have been wandering the hallowed halls of Chez Mama Mama by myself. 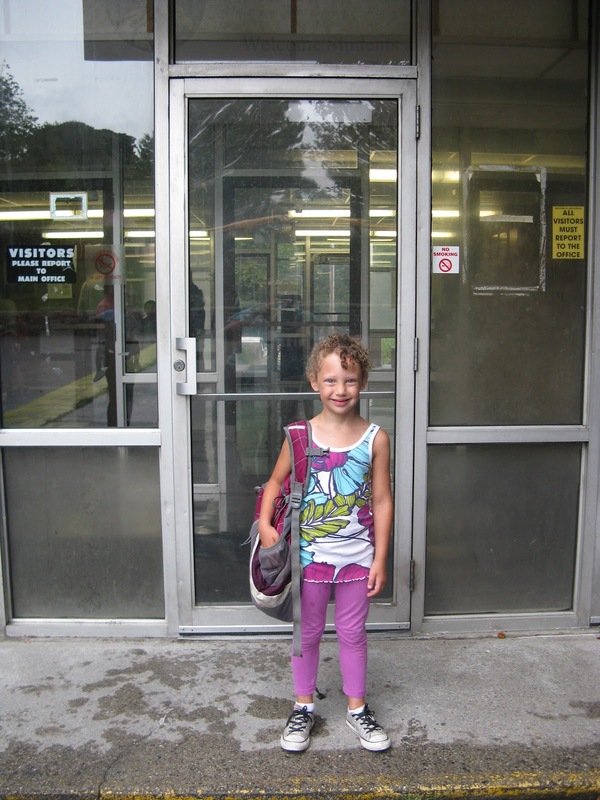 I thought I would be really sad to send Vivi off to first grade and my wee Turtles off to nursery school but I am not. Vivi was thrilled to go back and I got to have a good solid week with just her before school started. We went to the movies, cleaned out her clothes and did school shopping, took the train to Boston and visited the science museum, and had an all-around fantastic time. It was a great way to end the summer. Jude and Elie got their share of camp and adventures this summer too. We made bubbles and sidewalk paint. We had picnics at the park and worked in our garden. We went to the beach. We saw fireworks and decorated our shed with colored shaving cream. We did a lot and for the most part we enjoyed it all. Of course, the idea of going to school was looming over the Turtles' summer. They knew that they would be going to the nursery school associated with the Y and they were generally excited. (We are at the Y almost every day and they love it there.) Then they discovered that there was going to be a rest time at school and that was all they talked about for the month of August. Elie, in particular, was very anxious. She mentioned it when she first woke up in the morning and it was the last thing she talked about at night. I assured her that no one was going to force her to sleep but she wasn't buying it. I made them each a new blanket to take with them and by Tuesday morning, I felt like we were good to go. All of a sudden Elie is riding the happy train and Jude is having none of it. Eventually, Daddy was able to coax a smile out of ALL of them. Once we got to school, Elie was still excited but Jude wasn't totally sold on the idea. Yet, when we got to the classroom. They both were talking a mile a minute. Jude was explaining that she had a lucky penny and Elie was asking the teacher, Mr. Ted, about rest time. When he assured her that she wouldn't have to sleep, she gave him a huge smile and said, "Mr. Ted, can I give you snuggles?" I left my Turtles and no one shed a single tear! I was so proud of myself for making it through the first day of school with my big girl pants on! So glad you made it and that all your girls are off to a great start!